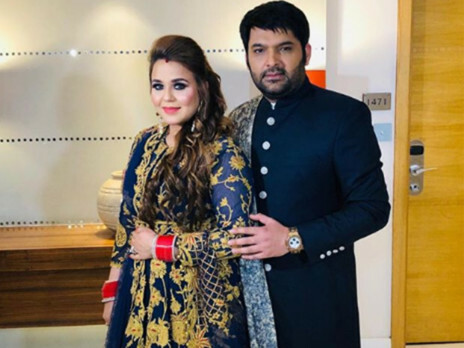 Comedian-actor Kapil Sharma and his wife Ginni Chatrath have hosted a wedding reception in New Delhi following their marriage in December. It was attended by celebrities such as Yuvraj Singh, Suresh Raina, Mika Singh, Daler Mehndi and Sohail Khan. Sharma took to social media to share a photograph from the party on Saturday. In the photograph, the newlyweds can be seen wearing Indian clothing. Sharma chose a blue bandhgala (Indian suit) with white trousers accompanied by a white shawl while Chatrath wore a blue anarkali (type of dress). “Celebrations are unstoppable. Need your blessings. Gratitude,” he tweeted along with the image. Singer Mika posted a video from the gala in which he is seen sitting alongside Sharma and cricketer Yuvraj. Singer Harshdeep Kaur also shared a glimpse of her performance from the reception. In a video, she can be seen singing ‘Mast Kalandar’ with Sharma and singer Mehndi. Sharma tied the knot with Chatrath in Jalandhar, Punjab, on December 12. A few days after, the couple hosted a reception in Amritsar for their relatives and friends from the Punjabi entertainment industry. On December 24, a reception was held in Mumbai that had Bollywood celebrities in attendance.